So today we brought out the fabric markers and crayons. I cut up 8x10 pieces of cotton. Together we talked about what our plants would need to thrive. 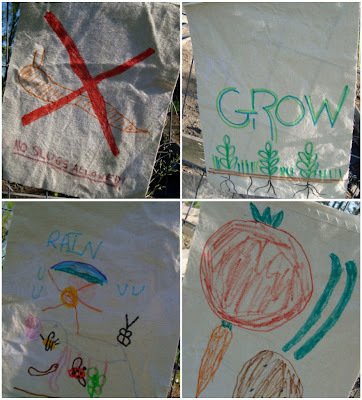 Individually, and in collaboration, we created flags to hang on our garden fence that represented our hopes and wishes for our little seedlings. There were lots of suns and raindrops... "good" garden insects and worms. Of course, a warning to all slugs had to be included. 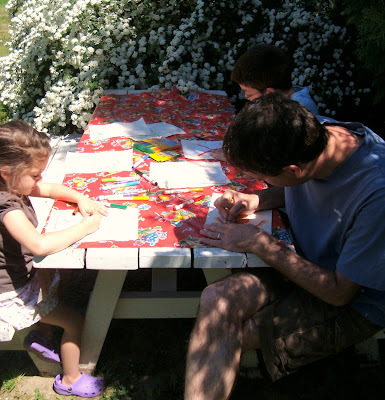 The conversation was fantastic as we sat at the picnic table all drawing together. 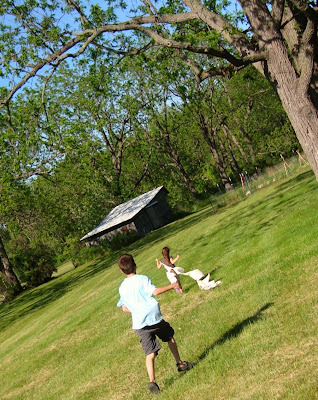 They raced down to the garden and we strung them up on the fence. If you're planting this summer, I can't recommend this more! These flags are happy, thoughtful and represent our family beautifully. Note: All of that time spent at our picnic benches drawing (on a Monday)...well, of course we had to do the family edition of Bench Monday! So much more fun together! 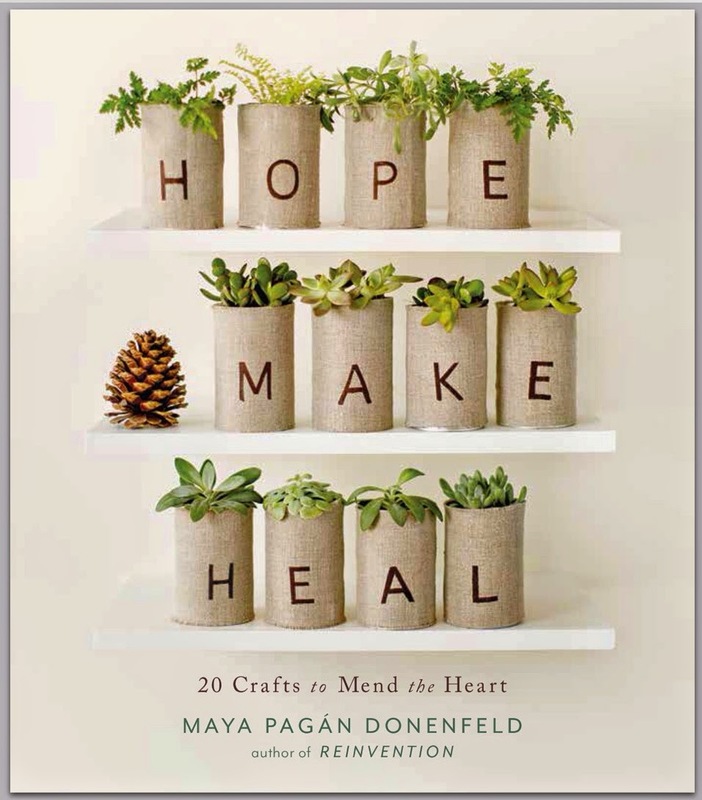 Great idea with the garden prayer flag, Maya! 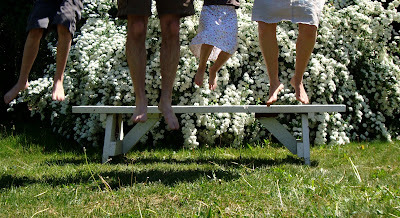 BTW, *how* did you get a photo of your whole family jumping like that? Certainly there was a 5th person??! What fun! 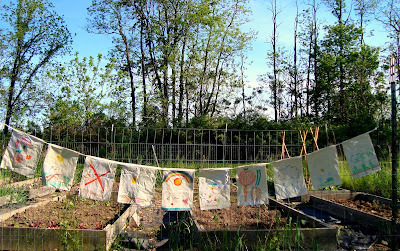 I love the garden wish flags - they remind of the prayer flags in Tibet, where the wind spreads the good wishes around the gardens. I love the flags & the photos of the making of the flags. It just looks like a perfect family day. 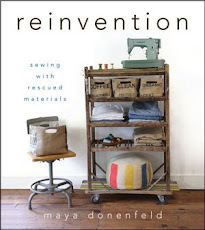 Thank you Maya! These family photos of you all spending time together and working together makes me so happy to see. Again, I am touched by your family's way of making their own traditions, based on things that make life truly richer and your relations to one another deeper and fuller. What a great idea. We'll definitely be adding this to our garden sometime soon. Thanks! Jacki- just the four of us and the camera with a self timer perched on a stool. There were MANY out-takes... and lots of hysterics! Michelle- these are very much in the tradition of Tibetan Prayer Flags. These are lovely as usual! Especially that you did it all together and just had/found the time to hang out in the garden and have fun! Enjoy the Summer! Another really great idea...and a wonderful photo, to boot! No slugs, understandable but Fern and I are so happy we didn't see a "no snails" sign. I have been observing my little friends very closely this spring and I think they are the best little mulchers around. My well trained little helpers only eat the dead leaves and fallen petals. I love your family version of bench monday. Fabulous, thoughtful project! I love the connections with and between family, nature, and creative energy. Thank you for another beautiful garland idea (for the outdoors too!). Such a great project and it looks like everyone had fun participating! I love your bench jump shot, too. 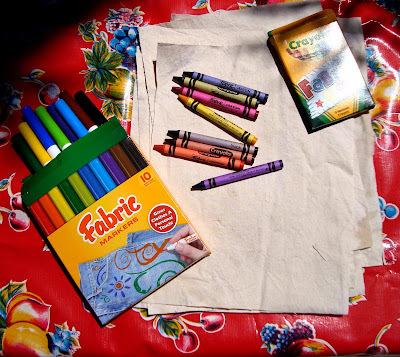 You've just reminded me to pick up fabric crayons and markers! I love those flags...what a fun idea! Fantastic - I'm definitely doing something with fabric markers now. Crayons too? How does that work? Perfect post, Maya! You all look like you're having so much fun hanging around together crafting outside. What a perfect combo! I need this for my garden, too. I love the "no slugs" - hope they listen! Maya, I liked this post very much. The flags are fantastic, but the family time story was even better. And that place of yours..? Perfect. What a beautiful idea! We're coming up on our first year of marriage and are enjoying our first spring in our first house. We're not in a hurry to have a family, but as much as I enjoy doing projects with my hubby reading posts like this sure makes me look forward to having a family and sharing beautiful things with them, too. What a wonderful mom and role model you are! what a great project for your garden! lately, i've been knee deep in experimenting with hand carving, which has caused me to want to stamp every little thing i see. currently, i've got my eye on stamping little tiny flags. your blog and projects are truly beautiful and lovely. The flags are sweet. Looks like it was a fun weekend! What a lovely idea! And the photo at the end... just brilliant! i love the garden wish flags. what a fun idea. and i'd gladly read tips about gardening with little ones! Love your flags! Your family has such a green thumb, our flags would have to mention things like "survive without water" or "don't die too quickly". Waaay too cute! I love this! Ours turned out great, come have a look. I hope it will become a tradition. Hi, Just seen this on crafty crow. Those look great! Fantastic idea! Hi, I have made a link to your blog.. 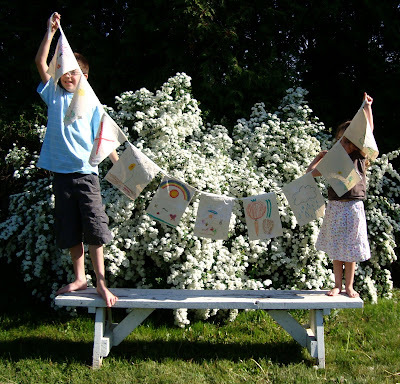 Knew I wanted "prayer flags" for our porch this summer. Wish flags are just the thing. Thank you! I love this!!! Totally going to steal the idea!! !